Pours a clear amber with reddish hues and an off white head. Not a whole lot on the nose but there is a nice toasted malt aroma. Well there is not much on the flavor also but more importantly there is nothing offensive about the taste either. It has a pleasant lightly toasted caramel malt sweetness with nice carbonation which makes this a very easy drinking and refreshing beer. It’s a good lager for sure but it’s not a good Oktoberfest. There really is not a lot of anything going for this beer. It’s not bad, not bad at all, I do rather like it. If you told me this was an American Amber/Red Lager I would rate it very high but not so much as an Oktoberfest. Still a very good lager even as it warms up a little. 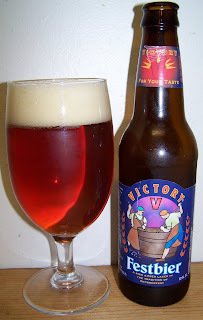 As an American Amber/Red Lager a solid B as an Oktoberfest it’s just a C, kind of average or a little below average.